Kinda interesting, what he does with a pile of sticks, isn't it? I like it a lot better than what my old 5th grade teacher tried to do to me with just one stick. I was trying to determine the width of the bottom by counting the strips, but pretty confusing. Can you tell me the width and the height of the sides? craiggamesh wrote: Beleive me Chuck, there was plenty of dust everywhere. 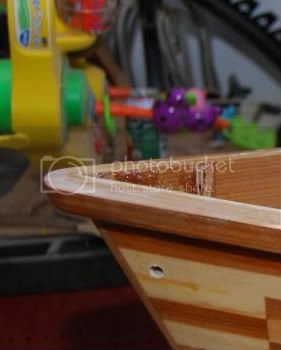 I took the Kayak out once to get it wet during the build of the pirogue. I needed a break. Next, I fiber-glassed the outside. I cut a 6 oz piece of glass the shape of the hull panel and applied it to the hull bottom with a squeegee. The next day, I covered the hull and sides with a layer of 4 oz cloth. This is the first build I have used 4 oz on. Boy what a discovery. It is so much easier to use then 6 oz. Then, I attached the outwales which were made of two layers of cedar laminated together. I used a 1 to 8 scarf joint to make pieces long enough. I cut these with a scarf joint jig I made for my table saw. I chose to have these extend the entire length of the boat. 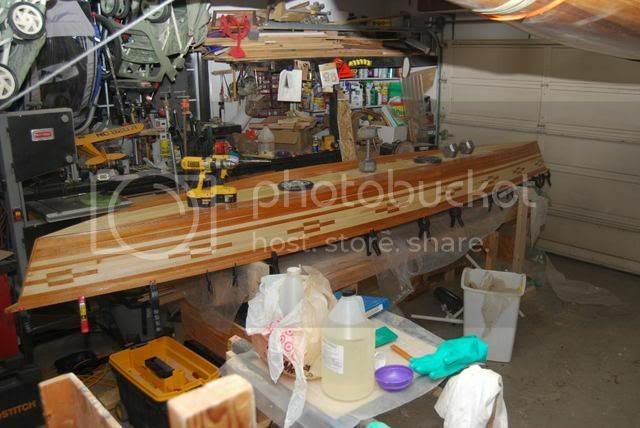 After the epoxy set, clamps were removed and it was sanded to shape. Ends sanded round. This is just to show the rounded end. This photo was from later in the build after I did the end pour. Then there were 3 or 4 fill coats of epoxy. I can't remember. Mate, beautiful build ! Can you please post more details and piccies of your table saw scarfing jig. I am considering doing my next build as a strip stitch and glue. Blufox and Mick - this thread is from 2008 and Craig, the original poster, last visited the site in January 2015. It is likely he won't see your questions but if you send him a PM the system might be set to email him an alert in which case he may pop in to answer you. By the way it's good to see you're still around Mick. Been thru some pretty radical life changes the last couple of years. I want to build a boat pretty soon but other things keep getting in the way. Sorry, It has been a busy couple of years. I thought I would check back in today and see if those SOT Tandem plans were available yet. The strips for the sides were just either 3/4 inch pin or cedar boards ripped with a thin kerf Diablo blade (under $10 at Home Depot). The bottom was ripped 2 X 4 material and 3/4 inch. The jig for scarfing was a strip screwed to the board with a runneron the bottom for the table saw miter track groove thinga-ma-bob. You know, the two grooves in every table saw for the miter fence. 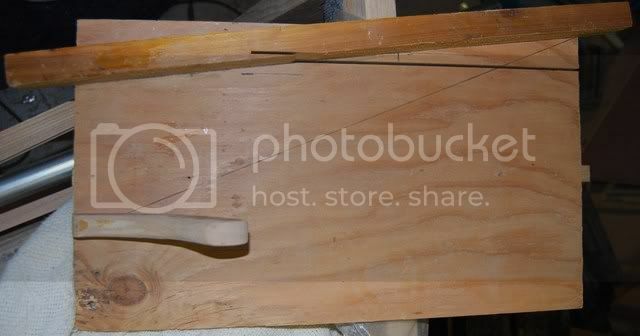 The "fence" for the jig was designed for an 8 to 1 cut. It was all made out of scrap.